If ever there was a sign that consumer attitudes towards electric cars are changing, this was it. Strange things started to happen even before arriving at the venue. Driving down the UK motorway network to Silverstone, increasing amounts of electric vehicles became evident heading in the same direction. Either it was an alien invasion, with the extra-terrestrials driving EVs, or it was a LOT of EV enthusiasts driving to Fully Charged LIVE. It was like being taken forward in time by around two years to 2020 when EVs will be a lot more commonplace on our roads. Upon arrival at Fully Charged LIVE, before 11am on the Saturday (the event only opened at 10am) the first observation was “Wow, that’s a LOT of people!”. Visitors walked up to the registration desk past a line-up of current EVs on sale, with the final vehicle being the all-new, all-electric Jaguar I-PACE – one of the first times that this car has been seen in public. Not that you could see the car, because of all the people crowding around it, in it, or on top of it if they could. It was obvious that this was the star car of the show – as expected. 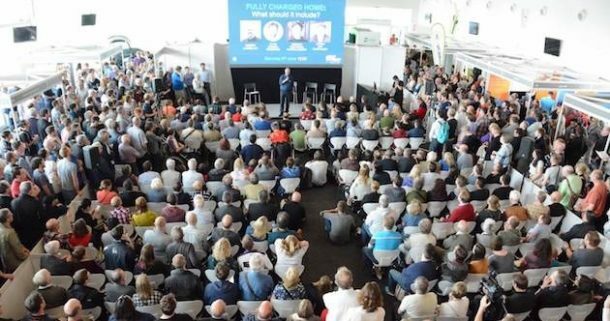 But of course the real star of the show was Robert Llewellyn – the main reason why 6,000 or so people paid around £30 each for tickets and travelled to Silverstone for the weekend. The idea was that Fully Charged LIVE was to be an ‘in person’ version of Robert’s online show, and even by midday on the first day of the event it was standing room only at all the live presentation sessions. Robert was involved in the stage shows, as well as Jonny Smith, Helen Czerski, and a wide range of other speakers. In addition to EVs, the other focus of the presentation programme was Robert’s second passion, renewable energy. The exhibition stands also reflected this mix of EVs and energy, and included a broad variety of businesses, including EV manufacturers, charging companies, home energy storage suppliers, etc etc. There were far too many exhibition stands to mention them all, but as an example, one of the partners of Fully Charged LIVE was DriveElectric, a company that has been growing its specialism in EV leasing over 10 years. DriveElectric’s Managing Director, Mike Potter, was impressed with the mix of visitors; although some already owned an EV, the vast majority had come to the event to find out more about EVs and the latest models on sale. Visitors were able to learn about smart charging on the DriveElectric stand, as the company is a partner in Electric Nation – a project that has recruited 700 EV owners to trial smart charging, technology which is due to be mandated by the government through the Automated and Electric Vehicles Bill. DriveElectric is also a partner in Nottingham’s ULEV Experience project, which is aiming to increase EV adoption with businesses in the city through events, fleet reviews and EV loans. The programme is funded by Go Ultra Low Nottingham, managed by Rasita Chudasama, who was interviewed by BBC Radio 2 presenter and producer Mark Goodier on the DriveElectric stand on the subject of EVs. Smart charging is just one example of many things that are happening in the EV industry at the moment. Another issue is the change from the NEDC fuel economy, emissions and electric range testing to the new WLTP regime – which is currently having a big impact on the availability of plug-in hybrids (PHEVs), as they all get re-certified, and in some cases re-engineered, for WLTP. Then there’s the imminent introduction of Clean Air Zones around the UK, which is likely to result in the rapidly increasing adoption of EVs. The Low Carbon Vehicle Partnership (LowCVP) is involved in the development of policy and communication about such initiatives, and many others, and the organisation was on hand at Fully Charged LIVE to explain to visitors about all these issues, as well as to find out how people would like information about EVs presented when making buying decisions. Apart from the live sessions, the many exhibition stands, and the latest EVs on show, there was also an area in the garages downstairs with a variety of fascinating and very desirable classic cars that had been converted from ICE to electric powertrains – and even the Riversimple Rasa hydrogen car. So the first-ever Fully Charged LIVE appeared to be a resounding success, and praise should go to Robert and his team for pulling it off. If you were there this year, then you can congratulate yourself for being a forward-thinker. If you weren’t there this year, then you need to save a space in your diary for next year’s event, which we can only imagine will be even bigger and better. Fully Charged LIVE has signalled that we’ve had take-off: the explosion in wider public interest in EVs has begun.